All Yellow Class pupils are making tremendous progress with our numeracy skills. Most pupils now feel confident to be able to count from 1 to 10 with the rest of the class. We are using our maths lessons to put in place a number of different programmes that help the Yellow Class pupils to understand the concept of a simple number line. Working on the class whiteboard, we have been inviting each class member to choose their favourite number line game. 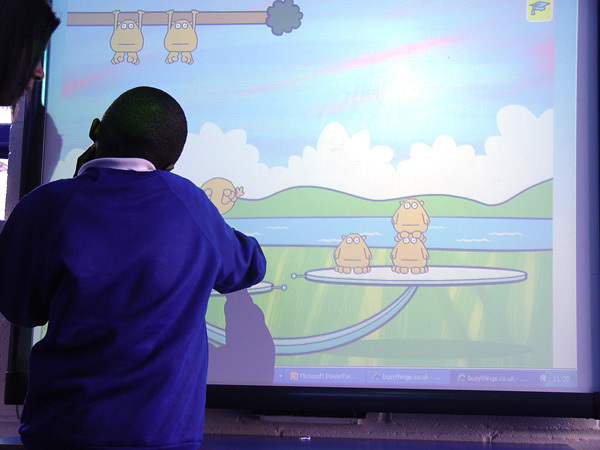 A popular choice has been the frog seesaw game! A seesaw is shown with a different number of frogs sitting at each end. Our task is to count how many frogs are at both ends, and then to work out how many frogs will need to be added to balance out the seesaw. We have found that if one end contains three frogs and the other side only one, two more frogs are needed to balance out the seesaw.